By early 1920 the price of the chassis had increased to £310, and £330 for the complete car including spare wheel, but oddly not tyres. Most of 1920 would seem to have been taken up in equipping the new works and producing a final product with announcements in the press every now and again on how soon it would be until cars were likely to be delivered, such as the announcement in Autocar on 17th July saying deliveries would commence the following month at the rate of six cars per week, reaching 40 cars per week by January 1921. Chassis numbers 1 – 30 were allocated for August, 31 – 85 for September, 86 – 186 for October, 187 – 300 for November, and 301 – 450 for December. 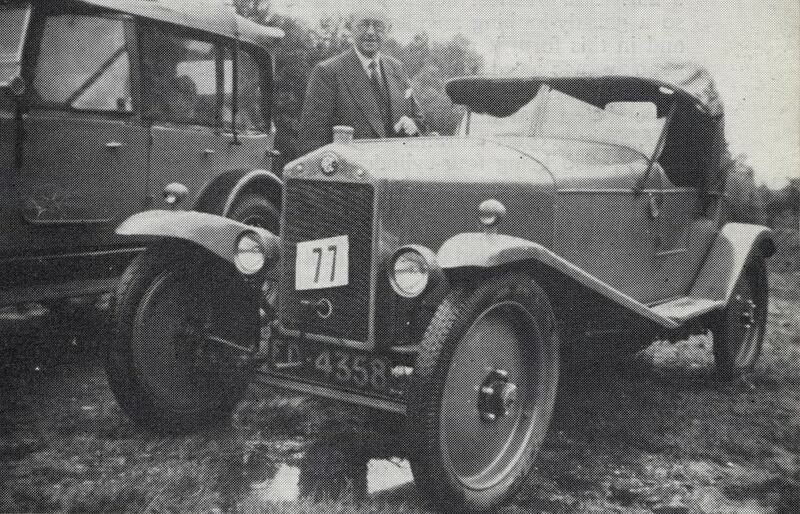 An encouraging development was the appearance of S C H Davis driving the fourth prototype (PB 5551) in its competition debut in the London - Lands End Trial on 10th April, and gaining a gold medal. This car had an aluminium bonnet, copper-plated radiator shell with transverse struts, and a higher-than-usual dickey seat. 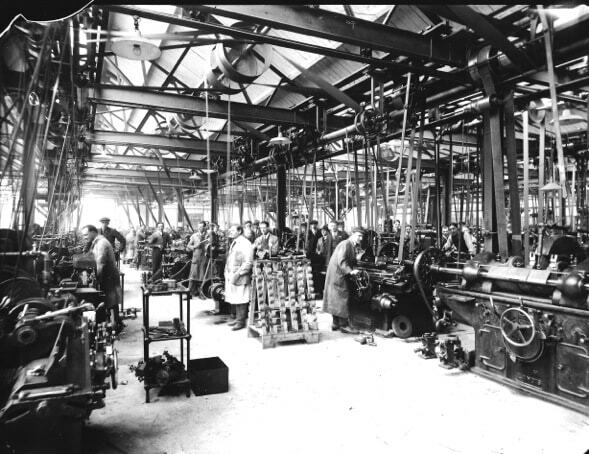 ABC’s new factory showing the grinding bay of the machine shop in mid-1921, as illustrated in "The Automobile Engineer". A rack of crankshafts can be seen in the centre. During 1920 it was estimated that orders for some 3,000 cars had been received, but many got fed up with waiting and cancelled orders, a fate unfortunately suffered by several would be players in the post-war rush to produce vehicles. Every few weeks a few lines would appear in the motoring Press assuring would-be owners that production would be commencing within the next week or two, and I will not bore readers with the number of times this happened, or with the minor specification and price changes that took place in this time. The first time most members of the public were able to see the car was at the White City Show in November 1920 at which a chassis, a standard 2-seater and a sporting model were shown. The standard car was now £415 and often called the Regent as early cars carried bodies by the Regent Carriage Company. The ‘sporting’ model was something of a misnomer, as there were no mechanical differences, just lower seating and no doors or dickey seat provided, leaving less timber framing used and hence a bit lighter construction. Slight variations to design now included the deletion of the crankcase air releases in favour of one larger air release on the magneto drive pinion casing; tappet adjustment was now on the rocking lever end of the pushrods; the size and shape of the inlet pipe altered; a joint introduced in the exhaust pipe so that the cylinders could be detached from the crank case more easily; the clutch enlarged in diameter with stronger springs, and a longer brake lever incorporated. Production was slower than that published in Autocar, and chassis No.27 (with engine No.53) was first registered on 24th January 1921 although it does seem that a few cars would have been registered late in 1920. Numbers issued were not in a strict sequence, and engine numbers were generally somewhat higher than chassis numbers. In the early part of 1921 as the works were progressing and incorporating its own body and paint shops, the Regent nomenclature was dropped in favour of the in-house Surbiton model which looked pretty much the same. The Sporting model had the battery box moved along the running board to provide a step into the car and access to the boot was by moving the seat forward, eliminating the need for a boot lid or dickey seat. In March the price was reduced to 365 guineas for the Standard two seater and 330 guineas for the Sporting model, whilst the chassis was available for 295 guineas. A surprising number of chassis did have coachwork by a number of outside coachbuilders including Gordon Watney of Weybridge, Compton and Hermon (probably for George England, the local Hersham agents), and Morgan & Co of Leighton Buzzard who produced a cloverleaf three seater for the British Motor Trading Corporation in black and cream. ABC 12hp Standard two-seater and dickey model. ABC 12hp Standard four-seater model. The company supported numerous trials of the period often with a team of five drivers comprising Vaughan Knight (Sales Director), Capt Charteris (Director), A H Jones (Chief Tester), and one or two invited drivers such as S C H Davis or Jack Falahee. In time, many other private owners also competed with considerable success up to about 1927 gathering cups, and gold, silver and bronze medals. Gordon England was one of the company’s early customers, his father George running the local agency. He modified his car for racing at Brooklands over the period 1921-1923. Suffice it to say that the car competed in the up to 1500cc class, but was hampered by being only 1223cc, in the same way that the 398cc motorcycle gave away 100cc in its 500cc class. In its final year the car was fitted with a Bristol Cherub aero engine in order to compete within the 1100cc class in the 200-mile race, and came fourth driven by Stephen Bassett. From March 1921 Sankey disc wheels became optional and soon standard instead of the artillery variety and in about May 1921 (Car No.203) a bevel pinion instead of a spur type of differential became standard in the back axle. A new Standard model was introduced in the latter part of the year looking similar to the Sporting model, but having side doors and dickey seat, whilst at the White City Show in November a parcel shelf was incorporated under the scuttle, carpets fitted instead of mats and a Smith’s electric starter and dynamo offered as an optional extra (from Car No.400). Both styles now came with aluminium bonnets and grey coachwork. Something like 550-600 cars were sold that year with latterly just two models being offered, the Standard and the Sports, these incorporating dummy honeycomb in the bonnet extensions for the cooling of the cylinder heads rather than being left as voids. Prices were now beginning to drop, to 365 and 330 guineas respectively. Gordon England was one of the company's early customers, his father, George England, being the local A.B.C. agent. His car was fitted with Rudge-Whitworth wire wheels, and had a pretty machined, streamlined, aluminium body with full-length undertray and quickly detachable mudguards. In this form it competed at Nailsworth Ladder in September, 1921, being extremely brisk, but bottoming on the rough surface due to the reduced ground clearance afforded by the undertray. It was also entered for the 200-mile race in October, but for this twin Solex carburettors were fitted, the crankcase breather supplied an oil mist to the exhaust valves, radiator shell, floor boards and foot brake were omitted, and the back axle ratio changed to 3.25 : 1. In practice, the streamlined body was found unsatisfactory, so a ghastly-looking angular affair was hurriedly built overnight, and in this form it raced for 2 hours 53 minutes and 15 seconds, at an average speed of just under 70 m.p.h., securing 14th place overall. Although this does not sound particularly good, it must be remembered that this was a 1,223 c.c. car in a class for 1,500 c.c. cars, and the other entrants' engine capacities were in the 1,496 c.c. region, also being four-cylinder cars in the main. In October that year a bevel pinion instead of spur type of differential became standard in the back axle, the number of cars being produced by this time being in the region of 200. A parcels shelf was incorporated under the scuttle, carpets were fitted instead of mats, and a Smith's electric starter and dynamo became optional, the starter remaining an extra for the rest of the car's production life. From the time of the 1921 Motor Show only the Standard and Sports models remained, both these having aluminium bonnets and French-grey coachwork as standard. A nickel-plated chassis was also exhibited. Due to noise and fumes from the silencer and exhaust pipe, which were situated under, and just behind, the engine, these items were moved to a new position under the seats where the objectionables were only heard and smelt by occupants of the following car. The Standard model had a battery box on the near side, which on the Sports model was moved back to provide a step into the car, and both models now sported dummy honeycomb in the bonnet side valences. Several were exported to India where they were tested on the Bombay-Poona road, the 120 miles taking just over four hours, and a petrol consumption of nearly 40 m.p.g. being returned. This road was fair for over half its length, but extremely rough for about a forty-mile section. In India prices were 7,250 rupees and 7,000 rupees for the Standard and Sports models, whilst in England they now cost £325 and £295 respectively.